Fountas and Pinnell is a Balanced Literacy Program most closely utilized for Guided Reading Levels from text level analysis. This early literacy program (decoding, fluency, and comprehension) determines the growth in students' reading levels, and is typically assessed at the beginning of the year, in the middle of the year, and at the end of the year. 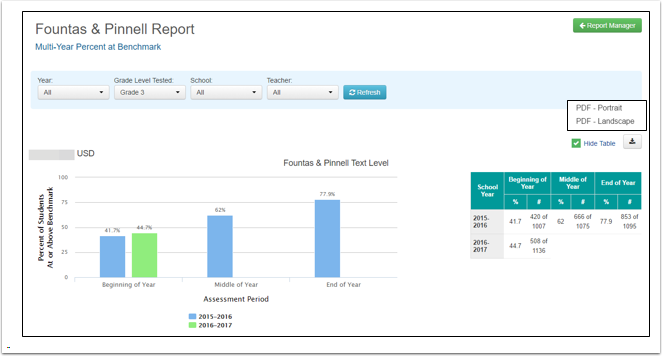 The SchoolCity Fountas and Pinnell Reports are tailored to each district according to the F & P measures utilized. This document reviews the F & P reports that are currently available. The list of reports begins with the Predefined Reports on the left, and the rest of the available reports to the right. Click on Fountas & Pinnell. Or, from the Launchpad, click on the REPORTS flip card. On the flipped side, scroll to the next page and select Fountas and Pinnell. Click on Text Level Status Report in blue type, or on the View icon (eye) to the right. Grade Level Results: Grade, Beginning of Year, Middle of Year, and End of Year when administered. 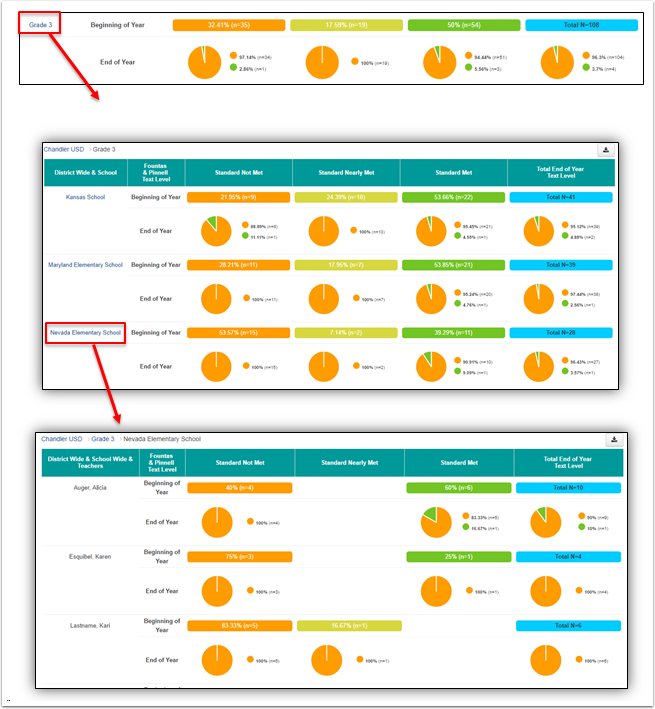 Color Coding Key: Three performance levels as shown in the pie graphs. Export to PDF, Portrait or Landscape. 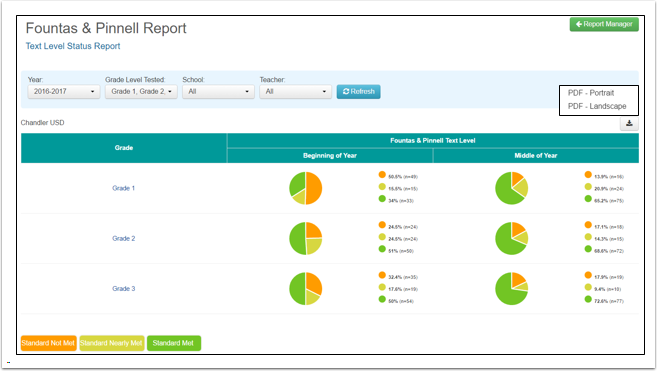 Click on a Grade Level to view District-Wide & School Level data. Click on a School Name to view District-Wide & School & Teacher Level data. 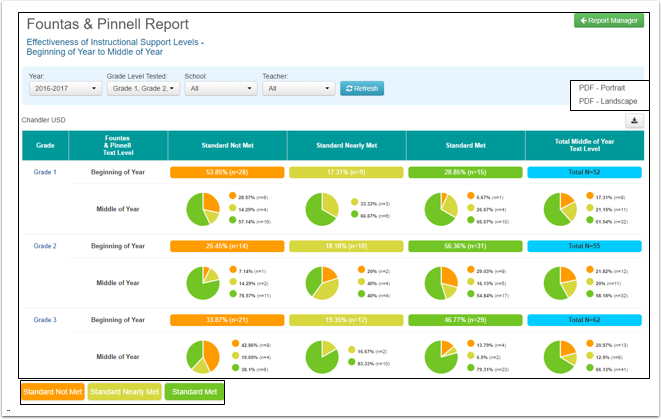 Click on Effectiveness of Instructional Support Levels Beginning of Year to Middle of Year in blue type, or on the View icon (eye) to the right. Grade Level Results: Grade, Beginning of Year, Performance Levels in bar graph format, and Totals, then Middle of Year and Performance Levels in pie graph format and Totals. 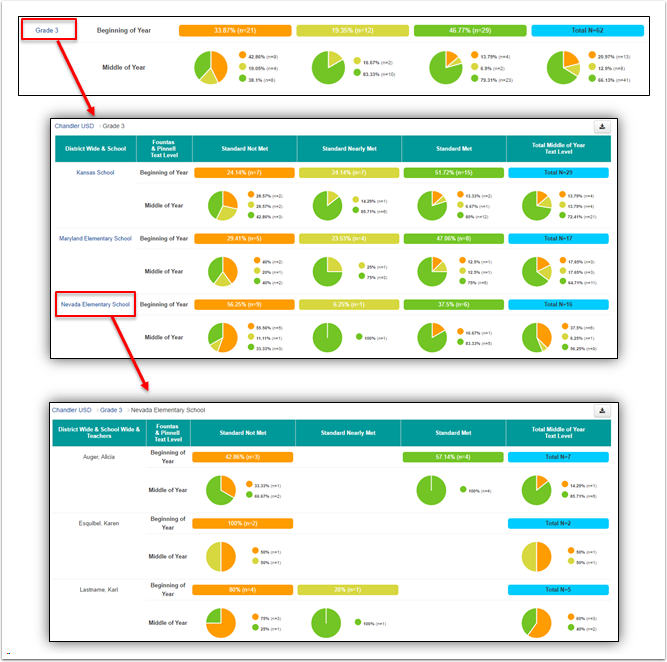 Color Coding Key: Three performance levels as shown in the bar and pie graphs. 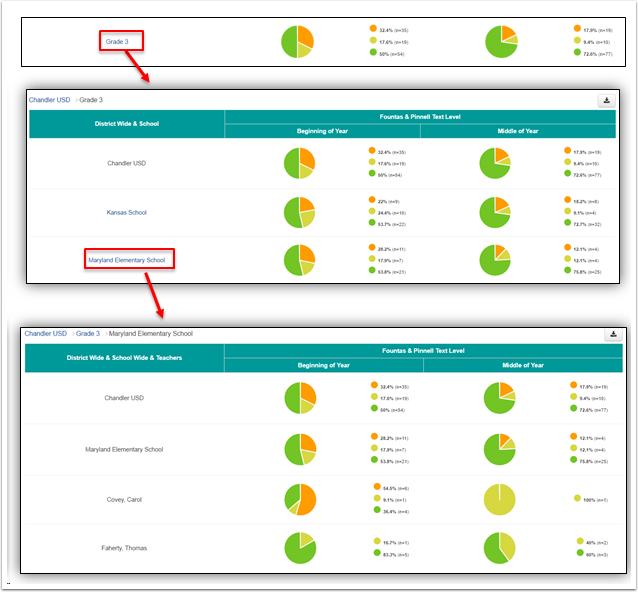 Click on Effectiveness of Instructional Support Levels Beginning of Year to End of Year in blue type, or on the View icon (eye) to the right. Grade Level Results: Grade, Beginning of Year, Performance Levels in bar graph format, and Totals, then End of Year and Performance Levels in pie graph format and Totals. Click on Multi-Year Percent at Benchmark in blue type, or on the View icon (eye) to the right. Bar Graph: Percent of students at or above benchmark for the selected school years, Beginning of Year, Middle of Year, and End of Year. Color Coding Key: The colors representing each school year are shown. Data Table: Bar graph data displayed in a table format. Hide/Show Table: Uncheck the box to hide the Data Table. Check the box to show the table. Click on Student Progress One Year in blue type, or on the View icon (eye) to the right. Create Group: Select students for a student group in order to re-teach, reassess, and/or follow on future assessments. Please see the Help document, Groups: Creating Student Groups, for more information. 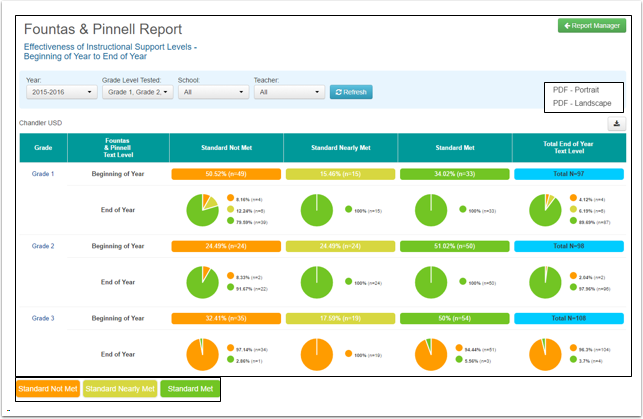 View Charts: Ability to click “view charts” for various visual representation of data for one student’s reading progress. Data Table: Bar graph data for each student displayed in a table format. Search: Enter a student’s first or last name to find that specific student. Click on the magnifying glass icon to see results. View Full Screen: Click to enlarge the window to full screen.